In 2009, OCASI established a set of voluntary organizational standards for the Settlement sector in Ontario and developed a user-friendly, online organizational self-assessment tool called OrgWise (CapacitOrg en français). The OrgWise self-assessment and tools are being used by agencies for planning, communicating with stakeholders, and the education and development of staff and board members. 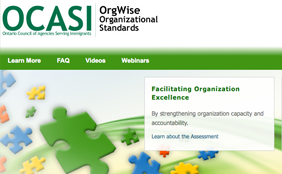 The OrgWise website, which serves as a key platform of the Organizational Standards Initiative (OIS) project, has undergone a number of substantial enhancements and improvements. Over the past year, our team has added new tools and features based on the comments and feedback from the OCASI Peer Learning Groups, OrgWise Capacity Building regional sessions, OCASI member agencies, and other interested third parties. New French and English electronic resources. Users now have the means to connect with their peers, engage in knowledge sharing and information exchange, and collaborate with agencies and settlement sector experts. Additionally, agencies can access OCASI resources and expertise to support organizational capacity building initiatives that have been informed by their self-assessments.